Retired: This product has been replaced by the SparkFun Power Cell - LiPo Charger/Booster. This page is for your reference only. Description: The PowerCell board is a single cell LiPo boost converter (to 3.3V and 5V) and micro-USB charger in one. The board comes with a JST connector for a single cell LiPo battery, a micro-USB connector for the 5V charge input, and selectable 3.3V and 5V ouput pins (labeled 'out'). There are also two charge pins broken out (labeled 'charge'), so you can use another 5V power source to charge the batteries, if you don't have a micro-USB cable . The micro-USB charger uses the MCP73831 and allows you to charge 3.7V LiPo cells at a rate of 500mA. 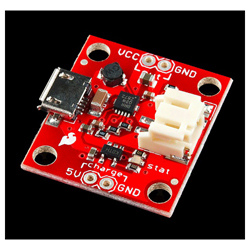 The boost converter is based on the TPS61200 from TI and has solder jumper selectable 5V and 3.3V output, and an under voltage protection of 2.6V. Note: This board does not have reverse polarity protection, so please be sure to recognize the polarity of your connections!